June 2018 - Read. Think. Act. (June 27, 2018) Catherine Read interviews Nicole Morris, Operations Manager of Women Giving Back (WGB), and Dona Dei of the Transitional Assistance Program (TAP), an arm of the Arlington Diocese Catholic Charities Prison Ministry at Loudoun ADC. These women are working to assist those who are transitioning out of prisons and shelters, and need assistance with clothing and accessories as they embark on a new journey to independence. 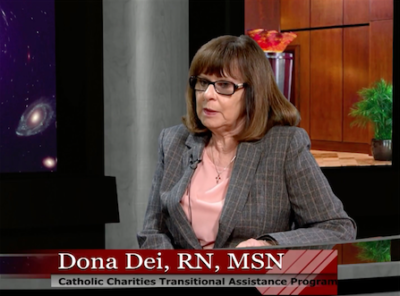 In the first segment Catherine discusses with Dona Dei the challenges faced by women transitioning out of prison. These women face many obstacles, including not having a home to return to, not having proper identification, not having necessary skills to land a good job and needing clothing. Many of these women lost everything they had when they went to prison, and have nothing to return to. Additionally, there are those who face addiction and substance abuse problems that prevent them from being able to move their lives forward. The TAP program is uniquely suited to work with these women in helping them reshape their lives. In partnership with Women Giving Back, TAP is able to identify the needs of each individual woman, and pair them with the services they need to get off to a good start upon re-entry to civilian life. 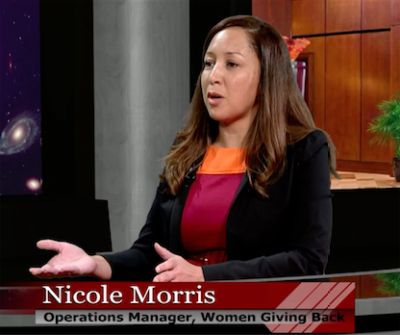 In the second segment Catherine speaks with Nicole Morris, Operations Manager for Women Giving Back (WGB). WGB’s mission is to support women and children in crisis, and build their confidence and self-esteem by providing great quality clothing at no cost, assisted by caring volunteers who offer personalized service and interaction. The organization was founded back in 2007 by a group of professional women, all of who were connected in some way with the local homebuilding industry. WGB was formed under HomeAid Northern Virginia as a way to supplement the great work that they do for the homeless and transitionally homeless community. WGB has grown considerably since then, and is now a 501(C)(3) nonprofit and runs a newly renovated 13,000 square foot warehouse and boutique in Sterling, VA.
WGB works with over 200 partner organizations to serve the needs of women in crisis throughout the Washington DC metropolitan area. With only 2 staff members, the organization uses over 2000 volunteers to carry out its mission. Volunteer tasks include sorting and organizing donations, providing personal shopping services to clients, driving donations to partner organizations throughout the metro area, and packaging the Bag-To-Go care packages for women who are unable to travel to the boutique. For clients who are able to travel to the boutique in Sterling, there are volunteers who act as personal shoppers, who can help them find a variety of clothing and accessories to meet their needs. The shop is open every second Saturday of the month for current residents of local shelters, transitional housing facilities and safe houses. Women and children who are qualified by their case managers can shop free of charge and take up to 50 items on each visit. The WGB website is a wealth of information for both clients and volunteers. The calendar lists hours of operation, along with volunteer opportunities. Morris shares that the organization was just given a grant to implement a more robust volunteer software to help better manage the different jobs and keep track of volunteer scheduling and communication. Every year they work with more and more corporate partners, who hold clothing drives, and then have their staff come into the facility and help with sorting and organizing at the end of the drive. Morris says this is a great way for a local company to give back to those in need right in their own community. The WGB website includes a detailed Donation Drive Guide for anyone interested in hosting an event. (June 20, 2018) Catherine Read interviews Toni Reinhart, a Certified Dementia Practitioner and owner of Comfort Keepers in Herndon, VA. After caring for her own father, who was diagnosed with Alzheimer’s disease, she noticed how difficult it was to navigate getting around in the community with him. Last March, Toni learned about Dementia Friendly America, an organization committed to helping communities support people living with dementia and their caregivers. Dementia friendly communities foster the ability of people living with dementia to remain in the community and engage and thrive in day-to-day living. Toni then went about establishing Herndon, VA as the first pilot community for the organization in Virginia. After receiving the green light to move ahead with this initiative from Mayor Lisa Merkel, Reinhart put together an action team to get started on the work involved to establish Herndon as a dementia friendly town. This included meetings and trainings with everyone from the local police force to business owners. The trainings covered communication tips on best practices of how to interact with elders, including to make sure that they use eye contact, to wait and listen, to remain calm, to not be aggressive and to not touch anyone unexpectedly. As Reinhart points out, these habits are good ones to have when approaching all people, especially elders who may be confused. Other challenges that are faced by seniors include that people do not wait, stop and listen. This can be important if someone is searching for the proper words or vocabulary so they can effectively communicate their needs. When Reinhart spoke with business owners or government officials, she stressed the importance of clear and simple signage, where instructions are short and easy to comprehend. Lighting in businesses like doctor’s offices and restaurants can help people see information on forms and menus. Restaurant owners were asked to instruct their employees to be sensitive to elderly guests and seat them in a quieter part of the restaurant, closer to the restrooms. These are all very common sense solutions that often do not cost a lot of money to implement, but can vastly improve the experience for someone suffering from dementia, and the caregivers who support them. There are also spillover benefits for many other people, especially those with other cognitive challenges such as autism, sensory processing or other mental health challenges. In the second segment of the show, Toni discusses the challenges for family members in identifying weather or not their loved one may be experiencing dementia. She notes that changes in behavior, such as confusion or disruptive behavior that is out of the norm, may be indications that their loved one might be suffering. When elderly parents are living alone, it is important to have good communication channels with friends and neighbors who can help identify some of these patterns. If they notice unusual aggressive behavior, paranoia, loss of vocabulary or recollection of details like names and places then it might be time to have them undergo an evaluation by their physician. On a lighter note, Reinhart shared some information about recent studies that indicate certain behaviors can help reverse aging in the brain. If your elderly loved one enjoys dancing, a recent Harvard study shows that dancing can reduce the risk of dementia by up to 75%, and 90 minutes of dancing a week has shown to reverse the aging of the brain. It has long been known that the music and rhythm is retained the longest, while we tend to lose other information like names and places. Listening to music can be therapeutic to elderly people suffering from dementia. Reinhart also notes that engaging in physical activity and following a heart-healthy and brain-healthy diet is also helpful. Social engagement is another important tool to keeping the brain healthy. When elders are isolated it has been proven that their health deteriorates. This is a particular challenge for elders who are aging in place in suburban areas like Fairfax County, especially if they no longer drive. Many communities are now establishing volunteer networks to help seniors get out and about. In Reinhart’s community of Herndon there is the Herndon Village Network, where volunteer drivers are available to take seniors out to meet up with friends, attend events in the community or just simply get out to the store. 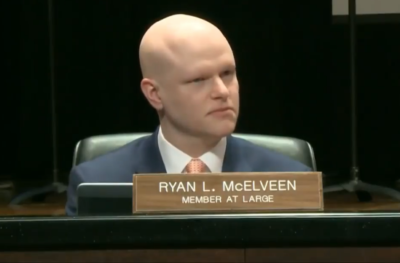 (June 18, 2018) Catherine Read interviews Ryan McElveen, At-Large member of the Fairfax County School Board. FCPS is the tenth largest school district in the nation, and Ryan has served on the board since 2011. While he is not serving on the school board, he works at the Brookings Institution, where he is a senior administrator at the John L. Thornton China Center. He welcomes the opportunity to have FCPS serve as a national leader on a variety of issues such as non-discrimination, gun violence prevention and dress code changes. In the first segment, Catherine discusses with McElveen the proposed changes to the FCPS dress code. The board is concerned that the current language used in the dress code policy has led to too many instances of body shaming for young female students. The board overwhelmingly voted to strike language from the code that “banned outfits with low necklines that show cleavage” and outfits deemed “sexually provocative”. Over the years many female students shared instances where they have been singled out and embarrassed by teachers or administrators. The revised policy is designed to avoid these problems. McElveen agrees that teacher training will be critical to successful implementation of the revised code. McElveen shares a short story about his own alma mater, Marshall High School. Over the years, during graduation, the boys and girls would wear crimson red gowns and the girls would wear blue ones. In an effort to unify the student body, the high school recently shifted to having everyone wear the same robe that incorporated both colors on the robe. In large and small ways, the schools are moving closer to a gender-neutral approach. Ryan has worked with various groups over the past seven years to move different issues forward. He was thrilled to work with the group Real Food for Kids to help improve healthy food options in FCPS cafeterias. Hand in hand with the division’s new Food and Nutrition Director Rodney Taylor, there have been a variety of new and exciting additions. Salad bars are being rolled out to all 141 elementary schools, giving children more options for healthy fruits and vegetables on a daily basis. The Summer Meals for Kids Program is a new initiative that will offer free lunch to any student at certain FCPS schools every day throughout the summer. Additionally, any adult over the age of 18 can eat a healthy meal for only $2 cost. Considering that many students, especially in our Title 1 schools, get their only meal through the school lunch program during the school year, this is a critical program to help the most vulnerable in the community. Shortage of facilities at FCPS is always a hot topic of conversation. McElveen shares some insights into why so many FCPS students are housed in trailers. For many years now, the Capital Improvement Budget of FCPS has been underfunded, in order to meet the other obligations of running the school system. As a result, FCPS is now on a 37 year replacement cycle (a 25 year replacement cycle is optimal). He shares that the board has successfully advocated for adding $25 million to the fund, they are still short $275 million to bring the fund up to standards. This means that students and teachers are working in outdated classrooms and labs, or are taking classes in trailers. In January of 2018 McElveen tweeted that “the number of FCPS students that attend classes in trailers each day is on par with the entire student population of Arlington County or Richmond. That is a travesty, it is an embarrassment and it is unacceptable”. The root cause of this problem is funding. This year is the first year in a long time that the Board of Supervisors fully funded the school budget request. Because of the Dillon rule, counties such as Fairfax have limited options to raise revenue on their own. Therefore, they rely on the County (property taxes), the State (state tax revenue), and the Federal government (federal grant dollars), to round out the budget. A recent ballot initiative to raise money through a “Meals Tax” in Fairfax failed. Even though most neighboring jurisdictions currently assess this fee on restaurant meals (Washington, DC, Arlington, Alexandria, along with the cities of Falls Church and Fairfax, and the towns of Vienna and Herndon), the business community and the chamber of commerce ran a brutal campaign to block this initiative. McElveen was thrilled that the BOS agreed to fully fund the school budget for 2018-2019. One of the most pressing issues that the board is dealing with involves teacher pay. Since the recession of 2018 and several years of pay freezes, FCPS fell far behind its neighboring jurisdictions in teacher pay. It has been a challenge to both recruit and retain teachers, who often leave for higher-paying opportunities. Raising teacher pay, which is included in this budget, will help work toward the goal of improved retention, especially for mid-career teachers. The board continuously evaluates the 5-year retention rate to see how they are doing in this area. After the General Assembly passed the Medicaid Expansion bill this past session, McElveen is excited about the prospect of millions of dollars flowing down from the state coffers to help invest in both students and teachers. When McElveen was first elected to the school board, he was 25 years old. He was young and technologically savvy, and used this to his advantage. He quickly recognized that social media was a fantastic tool to reach his constituents, and to obtain real-time feedback. As an At-Large board member in a county with a population of 1.1 million people, it is just not physically possible to meet with every single person that he represents, but he can connect digitally with them. He has witnessed the rise of social media as a key communication tool, and has seen how it can be used to organize and move issues forward. Today, he sees both parents and students utilizing these same tools to lead on a variety of important issues. Over the past few years there have been many programs on the “chopping block” each year, as the school system looks to balance the budget. When certain programs such as foreign language immersion or music in the elementary schools come up for review, he has seen parents and students come together to testify and organize around saving these very valuable programs. On the student side, this past year after the Parkland shootings in Florida, students used social media to help organize walk outs and protests, to call attention to the issue of Gun Violence Prevention. McElveen was impressed with how respectful, responsible and productive these demonstrations were. He is very proud of the many FCPS students who have stepped up to speak out for the things that they believe in. He wants to support student leaders so that they can develop the leadership skills that they will need in college and beyond. In the final segment, McElveen talks about the academy programs that are thriving at FCPS today. These are hands-on training and learning programs that give students a unique opportunity to take advanced technical and specialized courses that successfully integrate career and academic preparation. These centers include programs for Animal Sciences, Automotive Technology and Collision, Carpentry, Cosmetology, Culinary Arts and HVACR. Other specialized programs include Fashion Design, Theater, Health Informatics, Nursing, Fire and Rescue, and Automotive Dealers. If students are interested in any of these areas, they should speak with their guidance counselor to learn more and find out how they can apply. 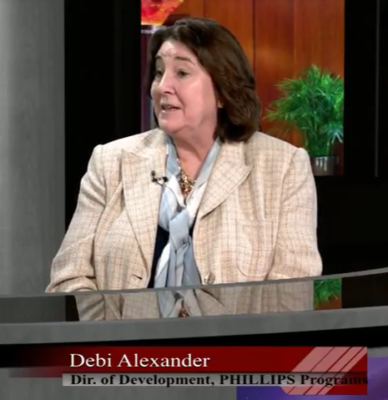 (June 14, 2018) Catherine Read interviews Debbie Alexander, Director of Development for The Phillips Programs. For the past 50 years Phillips has served the needs of individuals with emotional and behavioral problems and their families through education, family support services, community education and advocacy. Phillips is a private non-profit organization that serves the needs of over 500 children and their families in the Washington, DC area across four campuses in Virginia and Maryland. They strive to help children where others could not, by individualizing a plan for each student so they can become independent, young adults. Alexander shares that children are referred to their program when they are unable to thrive in their school environment. There is no typical profile for a Phillips student, but many have experienced trauma in one form or another. Perhaps they have difficulty communicating or engaging with other students or their teachers, and because of this the student acts out or misbehaves which interferes with the learning cycle. At Phillips, the educators and therapists develop a wholly personalized plan for learning that addresses the obstacles each student faces, and comes up with a plan to overcome the obstacles. With small class sizes of 9 students per classroom, this becomes a realistic goal. Additionally, Phillips runs programs to encourage families to stay together, as the stress of a child with disabilities can often tear families apart. Phillips offers home and community based counseling, behavior consultation and family support. As the organization has evolved over the past 50 years, Phillips has taken on the role of not only educating their students, but also preparing the students for a world where they can work and become independent. The Career Partners Program was implemented two years ago, and is now thriving. Phillips established a culinary program which includes a commercial kitchen and a vertical garden at their Laurel location, a 3-D design and print program at their Annandale location, and a building trades program at the Fairfax school. The concept is that they are giving their students marketable skills in order to enter the workforce. Alexander specifically highlighted the building trades program, where students just completed their first home that they designed and built all on their own. The home sold for $585,000 and took four years to complete. As she mentioned earlier in the interview, there is no “typical” student in the Phillips program. Students are generally referred to Phillips by the public school system, if the student struggles to thrive in a mainstream environment. Access to information and resources can be difficult to come by for parents who are looking for help, so the Phillips Program is re-vamping their website to include more information and become more accessible to parents. The main message that Alexander wants to share is that the Phillips Program gives hope to children and families, while focusing on the children’s abilities and highlighting their strengths. For example, the 3-D printing program, which operates as a partner of the Youthquest Foundation, is a great fit for students with autism. This type of work is ideally suited for people on the autism spectrum because it includes a number of repetitive tasks. The Youthquest representatives noted that the Phillips students produced the most sophisticated and complex work on the 3-D printer that they had seen to date. The Phillips program is a non-profit and operates on the donations of its generous benefactors. Each April they hold a gala, and in May they organize a 5K run. Alexander encourages those in the community to support this valuable asset in the community. You can donate online to support some of the most vulnerable children in our community and give them a chance to thrive and grow up to be independent members of society. 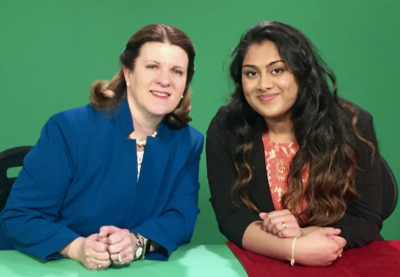 (June 11, 2018) Catherine Read interviews Poojitha Tanjore, a 16 year old activist and junior at Rock Ridge High School in Ashburn, VA, who is the Northern Virginia Rise to Run pilot hub coordinator. Rise to Run is the first and only nationwide, grassroots and community based organization focused on encouraging progressive high school girls and college aged women to run for public office. Rise to Run brings young women together in their communities and gives them insight into the political process, connects them with mentors, and involves them in local organizing. Through quality, in-person, age appropriate training and on the ground networks, Rise to Run is making electoral politics and political action more accessible to young women of every identity. Poojitha oversees the Northern Virginia chapters, which span from her home county of Loudoun, to Fairfax, Prince William and Arlington counties. Poojitha has been inspired throughout the course of her life by her great-grandmother, who was forced to marry as a child. Her great-grandmother did not have choices of her own, and her story has inspired Poojitha to take full advantage of her freedoms here in America, to forge her own path and create her own destiny. From a young age, Poojitha understood the power of her voice and her ability to affect change. She shares a funny story with Catherine about the time that her parents thought she was eating too many Maggie noodles. Poojitha gathered her friends, made protest signs, and picketed her parents until they allowed her to continue to eat her favorite noodles whenever she pleased. Thus began her life as a grass roots activist. At the age of 13, Poojitha was accepted into the prestigious University of Virginia summer enrichment program, where she studied law and participated in a Mock Senate. Her love of public policy was cemented here, and after being voted “Best Senator” in her group, returned to Rock Ridge that year and ran for President of the student government. She very much enjoyed leading her fellow classmates to push for initiatives like free wifi throughout the school system, which she helped to bring to fruition in Loudoun County Public Schools. Poojitha understood that by diving into the issues, overcoming obstacles and working together, she would be able to pave the way for lasting change. Poojitha learned about Rise To Run through her networks on social media, and immediately reached out to the founder and current Executive Director, Helen Brosnan. Poojitha strongly believes that young girls need to see themselves in their elected officials, so that they too can aspire to rise to those positions down the road. 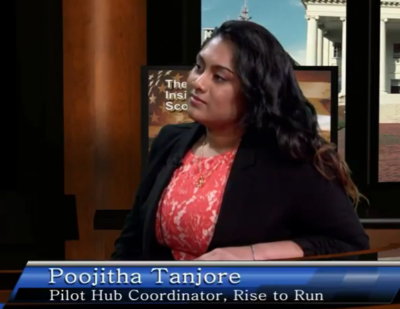 Poojitha founded the Loudon County chapter of Rise to Run, and was soon after followed by Price William and Fairfax Counties. The enthusiasm for the progressive movement is growing, and the desire of young people to engage and affect change is palpable. What she likes the most about this organization is that Rise to Run is giving young people the opportunity to learn and grown at a young age, in addition to giving them space to fail. Everyone needs an opportunity to learn, succeed, and occasionally fall short – it is what growing up is all about. Rise to Run encourages young people to take risks and try new things, and to use their experience to make themselves stronger for the future. Poojitha will represent Rise to Run at the upcoming Women’s Summit hosted by Network Nova, being held at the Dulles Hyatt on June 23rd. She will be the opening speaker for a breakout session specially designed for the youth movement. Poojitha strongly believes that young people need to be nurtured so that they have an opportunity to grow, learn and succeed. Poojitha also feels strongly that adults and young people need to partner together to help solve the big problems in the world. The Parkland students have shown us what young people are capable of achieving when taken seriously and with access to resources. Young people have strong and powerful voices and that can be used to move forward positive agendas. You can follow Rise to Run online at www.risetorun.org , on twitter @RiseToRun and on Facebook at www.Facebook.com/RiseToRun. 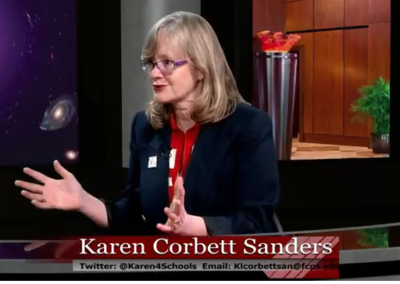 (June 6, 2018) Catherine Read sits down with Karen Corbett Sanders, Vice Chair of the FCPS School Board, representing the Mt. Vernon district. She represents a diverse district, which stretches from the Potomac River in the east, through the Rt. 1 Corridor, into Springfield and across to the Occoquan River. Some of the schools in her district are amongst the poorest in the county, with poverty rates as high at 90% in some places. These conditions put additional stresses on school personnel, and often require a different approach to ensure that each child in her district is getting an excellent education, no matter what their family background is or where they live. Karen Corbett Sanders opened the conversation talking about the needs of students who come from some of the most vulnerable communities within her district. She mentions the importance of providing “wrap-around” social services to students, to ensure that they have enough food to eat, clothing to keep them warm, and access to healthcare. In order for students to have the best opportunity to succeed, Corbett Sanders argues that we must invest in a strong support system for both students and their families. She points to literacy as a specific challenge for many families. In order for parents to stay up to date and in tune with their children, let alone be able to help them with homework at night, it is important that all families have access to literacy education. The Literacy Council of Northern Virginia is making great strides in helping parents learn the language skills they need, so they can more fully and equitably participate in the community. Corbett Sanders is proud of the One Fairfax Policy, adopted by both the Board of Supervisors and the FCPS School Board on July 12, 2016. It is a joint social and racial equity policy that commits the county and schools to intentionally consider equity when making policies or delivering programs and services. It is a written declaration that all citizens deserve an equitable opportunity to succeed if they work hard, regardless of their race, color, gender, nationality, sexual orientation or where they live. One Fairfax is a framework that will be used to consider equity in decision-making and in the development and delivery of future policies, programs and services. It is designed to help county and school leaders look intentionally, comprehensively and systematically at barriers that may be creating gaps in opportunity. Corbett-Sanders states that the adoption of this policy helps those in charge understand that there must be a different approach in a school community that has a 90% poverty rate vs. a school that has a 1.8% poverty rate. In the second segment of the show Catherine speaks with Karen Corbett Sanders about the program GrandInvolve. This is a unique public-private partnership that puts retired educators in Title I elementary schools to volunteer and help give back to their community. GrandInvolve has been recognized by the Governor as one of the top volunteer organizations in the state, and has had great success here in Fairfax County. The seniors serve as role models for the students, many of whom do not have Grandparents who live in the United States. The seniors bring a fresh, new perspective to the classroom and help support one-on-one learning with students. It is truly a win-win for teachers, students and the senior volunteers. Another new pilot program that Karen Corbett Sanders mentions involves placing police officers in the school cafeterias, where the officers are helping students in the lunch line, and getting to know them. Often times, children only see police officers in a bad or difficult situation. This type of partnership helps to build relationships and teach children that police officers are really there to help them, not hurt or punish them. Corbett Sanders is also very proud of a new initiative that is being rolled out to all FCPS students called the Passport to Mt. Vernon. This would allow free access for county students to Mt. Vernon, Gunston Hall, Gum Springs Museum and Woodlawn Plantation. We have such a rich source of history right here in Fairfax County, but our students who are the poorest and most vulnerable do not have access to these sights because they cannot afford the entrance fees. By offering free access, they are hoping to open up doors to those who were otherwise shut out. She also highlights the Bus Pass program, now in its third year. This offers any 7th-12th grader a free bus pass for the Connector Bus or the Q Bus in Fairfax City. Free access to public transportation allows students to get around independently after school or during the summer. They can travel locally to go to part time jobs, summer camps or the library. Corbett-Sanders is encouraged by the work being done between county and school board leaders to think outside the box and come up with workable solutions to help our most vulnerable residents. 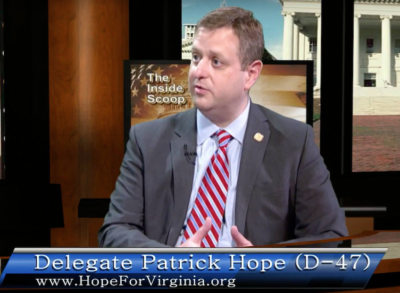 (June 4, 2018) Catherine Read interviews Delegate Patrick Hope (D-47) of Arlington to discuss the recent passage of the Medicaid Expansion in the Virginia General Assembly, as part of the biennial budget signed by Gov. Ralph Northam. Del. Hope currently sits on the the General Laws, Courts of Justice and Health and Welfare Committees in the House of Delegates, where he is able to lend his professional expertise from his career as a healthcare attorney. Del. Hope also serves on the Joint Commission on Healthcare and the Deeds Commission, which has been tasked with studying and making recommendations on improvements to Virginia’s mental health care delivery system. Del. Hope was elected to office in 2009, one year before the Affordable Care Act, otherwise known as Obamacare, was passed into law. Under the ACA, Washington allows states to open their rolls to people with income up to 138% of the federal poverty level, which is $16,750 for an individual and $28,700 for a family of three. The federal government agrees to pay 90% of the cost of expanding the rolls, totaling approximately $2 billion a year. These are dollars that Virginians have been paying with their federal taxes that will now be returning home. Baked into this year’s proposed budget is a tax on hospitals in Virginia, which is designed to cover the 10% cost that the state will be responsible for. Since the adoption of the ACA in 2010, Hope has advocated for expanding Medicaid, and bringing these federal tax dollars back to the commonwealth for individuals who fall in the “gap”. This gap exists because as the program works today, Medicaid in Virginia has a very low-income threshold for eligibility – $6900 for a family of three, $9700 for a disabled individual, and able-bodied childless adults are not eligible at all, no matter how poor they are. Therefore, insurance on the ACA marketplace was not accessible to the 300,00+ working poor citizens of Virginia. Effective January 1, 2019 this will all change. The influx of federal dollars to provide healthcare to those in need will free up money in the biennial state budget to invest in other important initiatives. Teachers will receive a 3% pay raise, all judgeships will be fully funded (and 30 judgeships will be added to cover increase caseloads), and state employees will get a 2% pay raise. Money will also be allocated to improve mental health services, as well as addiction and substance abuse programs throughout the state. Del. Hope points out that these are important investments in our safety net and our future. The adoption of Medicaid expansion will also be a big boost to the state’s economy. By bringing 300,000+ residents onto the healthcare rolls, we will need to find healthcare “homes” for all of the new patients. More doctors, nurses, support and administrative staff will be needed to accommodate the increase in patients. These will be new, well paying and sustainable jobs that will help drive the economy forward. In order to bring Republicans on board with adopting Medicaid expansion, there are several provisions that were incorporated into the new law. Work requirements will be imposed on all able-bodied adults age 18-55, to ensure that nobody is getting a benefit without putting effort into finding or training for work. The program is called the Training, Education, Employment and Opportunity Program (TEEOP), and will have to seek approval by the Trump Administration before it can be implemented. Del. Hope praised the bipartisan work in the House of Delegates, who included Medicaid expansion in their original proposed budget, along with the hard work and brave efforts of Sens. Emmett Hangar (Hanover), Frank Wagner (Virginia Beach ) , Jill Holtzman Vogel (Faquier) and A. Benton Chafin, Jr. (Russell) who propelled the Senate to move the budget forward with Medicaid expansion included. There will be much work to be done to get the program off the ground, but passage of the budget was the first step of the process. (June 3, 2016) Catherine Read, host of Kitchen Table Conversations, sits down with Karen Duffy, who runs the Virginia Chapter of the Pajama Program. This program ensures that all children, no matter where they are living or what their income level, have a cozy set of pajamas and a book to read before they go to bed. Their goal is to ensure that children experience a good night sleep, and awaken with the spirit and energy to make every day positive, happy and hopeful. They accomplish this with the magical gift of a new set of pajamas and a book, ordinary objects that transform their bedtimes into comforting rituals of love, support and fun. The Pajama Program was established back in 2001, and has grown to have chapters in all 50 states. Duffy is an Kindergarten school teacher, who organized drives for the Virginia chapter each year at her elementary school. When she learned that the Virginia chapter head was stepping down, she decided to step up, and now she coordinates the statewide effort to help connect volunteers with over 90 receiving organizations. Organizations who accept donations include homeless shelters (such as Shelter House), domestic abuse shelters, group homes (orphanages), and at-risk children who are identified through the hospital. Every child has the right to a sense of stability and security. Every child has the right to feel loved and cared for at bedtime. Every child has the right to wear fresh, clean pajamas to bed, and to enjoy a bedtime story that fires their imagination. Every child has the right to feel valued and validated as a human being. Every child has the right to a good night, and a good day. Duffy points out that although it is more fun to buy pajamas and books for young children, kids of all ages are in need of these items. One suggestion she had when running a donation drive, is to have kids bring in pajamas and books for kids their own age. She hopes that organizations like scouts, school groups, businesses and places of worship will learn about the Pajama Program and choose to plan a donation drive. Unfortunately, there is no shortage of children who can use a fresh set of pajamas and a new book. (June 2018) “I’m not here to make you a great actor. That’s not my job. The reasons you should be taking this class are far more important. I want you to gain confidence, learn something about life, grow up a little bit. I want to help you see who you are.”– Lou Volpe, Truman High School – Theater I Class. The author Michael Sokolove was one of Lou Volpe’s English students back in the early 1970’s at the beginning of Volpe’s career in education. Four decades later, he returned to tell the story of how this teacher inspired his students and the community of Levittown, PA, by creating a first class theater program in a working class town. The book was published in 2013 and concludes with Lou Volpe’s retirement from teaching. In March of 2018, the television show Rise, inspired by this book, debuted on NBC with trans actor Ellie Desautels among the cast members and Lou Volpe on board as a consultant to the show. The book is more than just an homage from a former student to a teacher who inspired him. There is a lot of background contained in these pages having to do with the genesis of the community itself and the students and families who live there. Levittown, PA, is one of the communities that sprung up after World War II when there was a desperate need for housing and the GI Bill made homeownership possible for returning veterans. Sokolove’s father Leonard was one such returning veteran who received both housing and educational benefits, getting an undergraduate degree and a law degree following the war. Sokolove doesn’t shy away from talking about how William Levitt’s creation of post-war suburban America was for whites only, a topic discussed in depth in The Color of Law. The working class community of Levittown is still predominately white, with a small population of Hispanics in residence now. The industries that once employed many who lived in the town are now shuttered. Volpe’s students come from families who are struggling in a variety of ways. Lou Volpe was not involved in theater as a high school student himself. He started out at 21 as an English teacher at the high school and applied to be the assistant Theater Director. He was given the job of Theater Director when the current incumbent left the school and from that point forward became a self taught theater producer and director. Throughout the book there are references to Volpe’s love for Stephen Sondheim and particularly the musical Sunday in the Park with George, which he has seen performed more than 25 times. For him, the play is life changing. He clearly wants to create those life changing moments for his students. It is quite remarkable that such an underfunded theater program was revered by those on Broadway who came to admire and respect what Volpe was able to do with his program and his students. Musical Theatre International (MTI), which licenses plays for production, tapped Lou Volpe to adapt several Broadway musicals for the high school stage. Among them were Les Miserables, Rent and Spring Awakening. Sokolove spent two years researching this book and in those years was there for Truman’s productions of Good Boys and True and Spring Awakening (which was re-created in the season finale of Rise on May 18th.) Some of the most interesting parts of this book are his detailed descriptions of the creative process and the student actors. 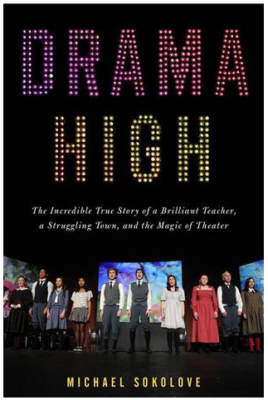 As a former high school theater student myself, everything about this book resonated with me. I took four years of Drama classes at William Byrd High School in Vinton, VA, along with my best friend Jeff. (We were the only two students in Drama III and Drama IV.) While neither of us ended up as Broadway actors, we both gained a lot from our love of the theater and our pursuit of mastery within it. And that is really the goal that Lou Volpe has from the beginning for his students. I loved everything about this book. I can see how it inspired a television show in a time when arts education is seen as optional and unimportant in the grand scheme of things. Many of us understand that arts education is everything. What would humanity be without the arts?